In a high-density residential and commercial suburb such as Bondi, electrical services that are trustworthy and affordable keep things running smoothly. Our skilled team of local Sydney Electricians at Randwick Electrical is small enough for you to get a personal, reliable service, and at a good price. When you call Randwick Electrical you get gold class service! That means we treat every client with the same respect and attention. For optimum smoke detection, smoke alarms should be installed in every room, living area and hallway of your residence or business in Bondi. This is very important where occupants sleep or work with a closed door. In multi-level buildings, we recommend additional smoke alarms be installed in the path of travel between each level. With Randwick Electricians on your side, it’s easy to bring your building up-to-code. For those of us who live in high-density areas, it can be tricky to pay all the bills as costs of living rise. Small improvements, such as LED lighting, can make your energy bills lower all year ‘round! 24/7 Emergency Electrical Service in Bondi! 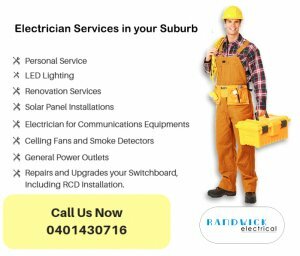 If you’re looking for a reliable emergency electrician in Bondi, look no further than Randwick Electricians. We extend a warm welcome to all businesses that serve the Bondi area. Being a business owner is tough. At Randwick Electrical, we know that an electrical emergency can be devastating to a business. That’s why, when you choose Randwick to be your emergency electrician in Bondi, we provide upfront quotes and get the job done quickly. Don’t Get in Hot Water. . . Call Randwick Electrical! Our Electricians are covered by $20M Public Liability Insurance and offer 12-month guarantee on all the services we provide. We also have all the latest tools and technology, and current know-how to provide you with the most efficient and professional electrician service in Bondi. Randwick Electrical Services can offer advice, provide installation and maintain a wide range of alarm systems, security systems, door entry systems, and CCTV systems.